The cruise line posted on its Facebook page that all guests booked for the cancelled cruises would receive a full refund. But Sen. John D. “Jay” Rockefeller IV, D-W. Va., wants to know if the cruise line is also planning on issuing a refund to the Coast Guard and the Navy. 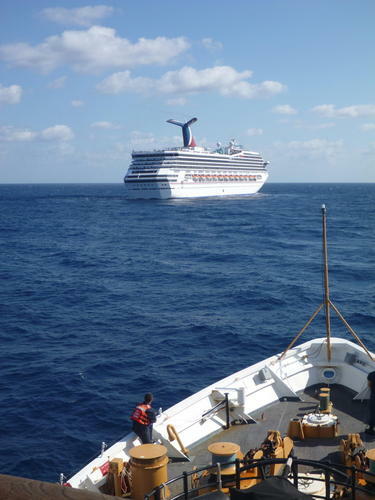 Just last month, the Coast Guard escorted the Carnival Triumph to Mobile, Ala. The vessel had to be towed after an engine-room fire left it stranded in the Gulf of Mexico. During that incident, a Coast Guard helicopter crew also transported about 3,000 pounds of equipment, including a generator, to the Triumph. About two years ago, the Coast Guard also assisted the Carnival Splendor, which was stranded for days without power after a fire in the boat’s generator compartment. Tales from the ship included passengers enduring overflowing toilets, rotting food and no air conditioning for several days. The aircraft carrier Ronald Reagan also responded to the Splendor incident. Similar reports of unsanitary conditions surfaced from passengers aboard the Carnival Triumph. Those are two high-profile cases, but since 2008 the Coast Guard has responded to 90 incidents involving Carnival Corporation and Carnival PLC owned cruise ships, according to information provided to Rockefeller by the Coast Guard. So what do you think? Should Carnival have to refund the costs of the Coast Guard and Navy response to Carnival cruise ship incidents? If not the cruise line for sure their insurance company should be made to pony up. I’m sure the tugs that came out and finished the tow didn’t do it for “free”. Lives in danger is a separate issue. If Carnival wants and expects the US Military to assist for free in a preventable emergency, then just maybe they should register their ships in the US. Ships not registered in the US should expect to be billed for our services. Oh, as a side note when we helped bring food and water to Carnival Splendor in 2010, what we got in reply were the complaints about the quality of the food. I didn’t see the PR folks from Carnival owning that fiasco. The food they got was food that could be served without cooking (which they could not do). We’re glad to help, but Carnival needs to pay.